Overall not a bad campground however it does not deserve a 9.5 rating for the following reasons: 1. Interior black top roads are in disrepair. Some potholes and ponding of water, rough surfaces, and loose gravel 2.most sites are just dirt! !, the gravel that was put down a long time ago is mostly gone. needs to be refreshed. 3.SEWER is non existant. The sites with "sewer" have a tank to dump into. You have no idea how much is already in there from previous campers. They have to pump out the tank when full. But who knows when it is full until it starts to backup while dumping. 4. You cannot use your washer because of #3 above. 5. Overall a "dirty" look of the campground. 6. Campground office is nice! Very nice park. We stayed 12 days and were very satisfied. The only reason I didn't give the value higher stars was that I feel it is overpriced...but that is the area. The site was roomy and fairly level. Had good internet and cable TV. The site we had felt pretty private and was shady most of the day. We would definitely stay here again if in the area. Very convenient to the train into Boston South Station. Easy access. Pristine laundry/bathrooms. Quiet w/ nice tree lots and open lots. Owners were incredibly helpful when we experienced an electrical issue with our large 5th wheel. 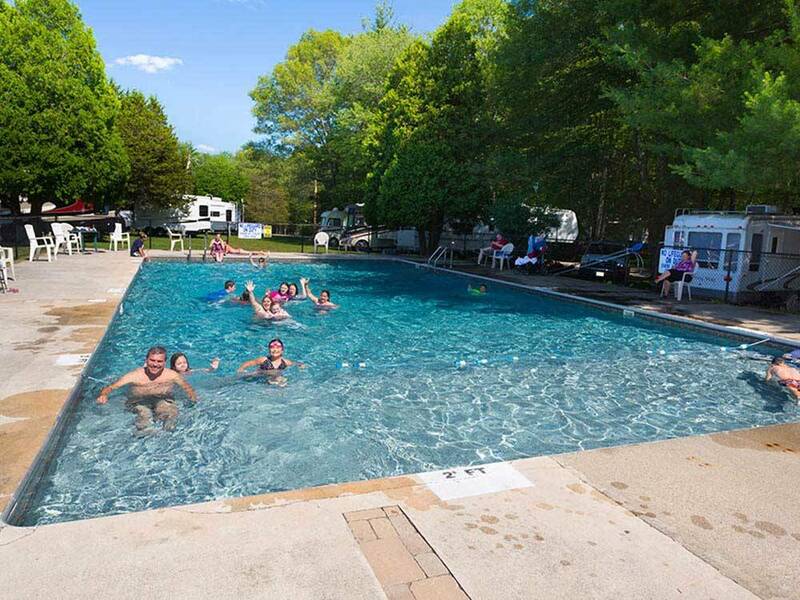 This is a family run campground with lots of trees and nice size lots. We stayed here for three nights and also stored our motorhome there while we took a cruise. The people are very accommodating! The laundry and bathrooms were very nice. We enjoyed our visit. It would be a great place to stay with children also. Although it was very clean! It was VERY buggy. 2 nights we couldn't even sit out by the fire. This is a huge turn off. We chose this campground based on location and Good Sam rating. The location was fine but Good Sam needs to revisit. There are nice flowers at the entrance but the amenities are overgrown with weeds, campers are allowed to have laundry hanging and trash bags outside etc. I was going to swim but pool was closed. Nice worker unlocked it for me stating that it was heated. Not! Cold and dirty. Sewer hookup was overflowing. When we registered they had a basic charge, took off the Good Sam discount, then added almost the same amt. back on as a "50 amp charge". We didn't say anything but somehow didn't seem right. 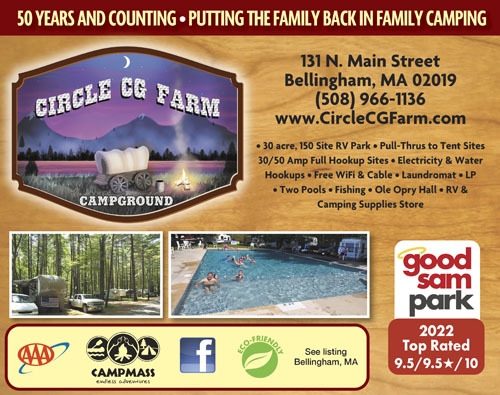 We are absolutely new to RVing and had bought our travel trailer about 2 weeks prior to visiting Circle CG. Our first time out we arrived in darkness and, once we were quickly checked in, easily found our site. Upon starting to back the trailer in, several other campers came out to lend a hand in guiding us in. Our stays were two nights each over two successive weekends. The staff was great, all the utilities worked fine, and the restroom/shower facilities were spotless. Our stay was at an off time of year, so the park wasn't really crowded and the usual activities weren't going on. We are planning a stay in late May of this year to see how the place operates at full capacity. A strange place. Its in the middle of an area with sub divisions and commercial shopping. Looks like the property had been in the family a long time. Hook ups were bad. Poor water pressure, overflowing sewage and the breaker kept tripping in the box. Won't be back there.